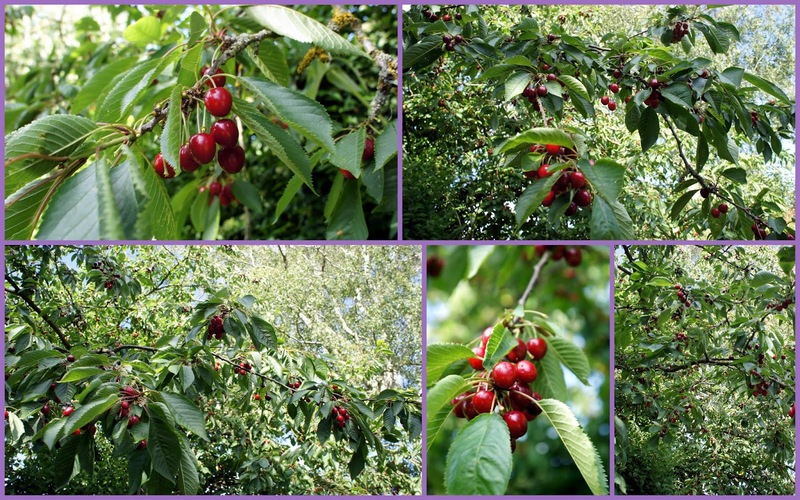 It has been a bumper year for the cherries in our garden, in fact in the time we have been here I don't remember so many. Even the birds can't cope with them. Peter and I picked 10lb this afternoon and hardly made a dent. This batch is destined to become jam and I just used 3 lbs to make cherry gin!! We also plan to make Sweet Pickled Cherries which are great with duck or gammon. The recipe we have is from the Joy of Pickling by Linda Ziebrich. Think of me tomorrow as I stand a pit all these cherries. Come back, bring the gin and I will help take care of that. If I were just a bit closer, I would be happy to help with the jam and pickling as well. Seriously, that all looks divine. My cherry tree is only in it's second year but had lots of fruit. Then one day it was all gone. Birds I assume. What gorgeous cherries! Can't believe you get such a bountiful crop in your own garden. When I show these pictures to my husband when he gets home he is going to be so envious. He was nurturing the one single cherry on our tree and some bird came along and eat it. Must add though that this is a new tree to our garden so hopefully next year our crop will be more plentiful. Your cherry gin sounds delicious!